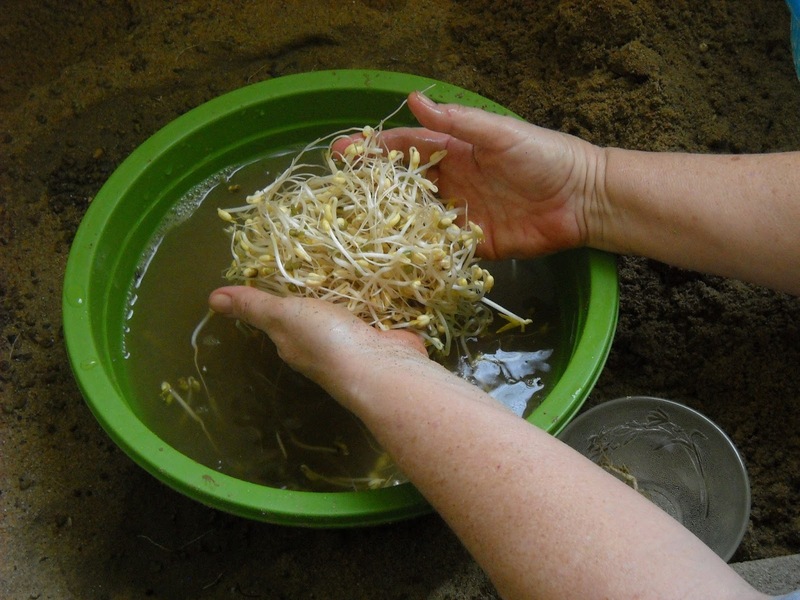 Growing bean sprouts can afford you the benefits of fresh produce in four or five days at any time of the year, in any climate, and requires neither sunlight nor soil. 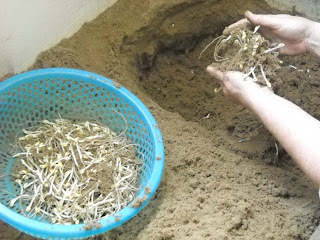 This technique produces large quantities of ready-to eat organic produce, utilizing only clean sand and water, a plastic strainer and basin, and your bare hands. Clockwise from upper left: dry mung beans, soaked beans, decanted water--ready for addition to soup, bean sprouts. Start out by rinsing your beans (I'm using mung beans in these photos) and then allow them to soak in a bowl of water. After about 8 hours, drain the beans, which will have doubled in size, and reserve the liquid to use later in soup. 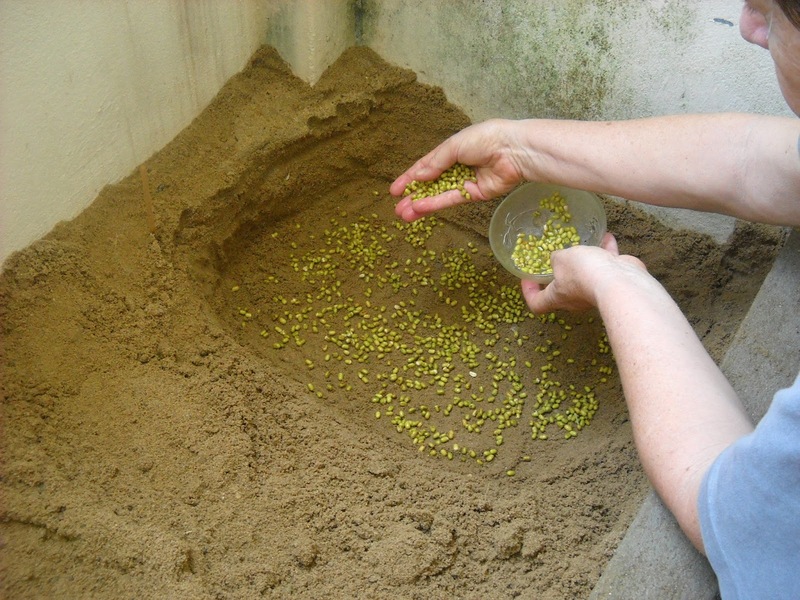 Spread out a single layer of beans in damp sand and cover with several inches of sand. Top off with some more water if the sand is not already sufficiently damp. The deeper and better drained your volume of sand is, the less chance that the beans will rot instead of growing. My own bathtub-sized container is located on a covered porch. It's made of brick and cement and allows drainage from the bottom. 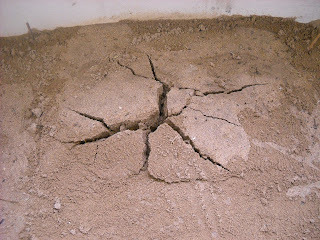 I use local builder's sand, most likely dredged from a brackish river, with any residual salt having been leached out with fresh water. An over-sized container such as this allows you to grow multiple batches of sprouts, staggering their maturity so that you could potentially have fresh sprouts as often as you like. Some folks here in coastal Vietnam use a section of concrete drainage pipe filled with sand, set on end on a bed of sand. Others just bury their beans directly in a patch of sandy ground. In the winter, in colder climates, sprouts would need to be grown in a more protected location. In a few days (depending on the depth you planted, the temperature of the sand, etc.) the bean sprouts will start to push up through the surface of the sand. At this point, you can either procrastinate by tossing a bit more sand atop them, or else get ready to dig! Bare hands work best for me, allowing me to extract the sprouts with minimum breakage. 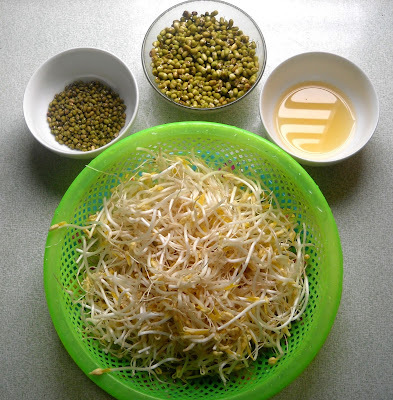 Deposit your new bean sprouts in a sieve, rinse three times in fresh water, and you've got fresh bean sprouts! Dump your rinse water back into the sand so that you don't clog your sink. I clean as much organic material out of the sand as possible with a strainer between plantings to minimize the risk of rot in subsequent batches. The neatest thing about this technique, from my point of view, is that the sand does the work of removing almost all of those annoying little green seed jackets with no effort on my part!